You wake up one morning, just happen to look down at your feet, and notice that you’re losing toenails for seemingly no good reason. It would be understandable if you panicked, thinking something was seriously wrong. What caused this? Will they grow back? What can you do about it? Losing toenails can be alarming, and sometimes painful as well. Let’s take a look at some of the causes of loose nails, and some of the things you might be able to do to keep it from happening again. It’s actually fairly common for people to suffer certain nail disorders, such as an ingrown toenail or even toenails that become loose. When it comes to loose toenails, there’s actually a medical term for the condition – onycholysis. Onycholysis is the condition that results in the loosening of a toenail from the nail bed. This may begin at the tip of the nail, also known as the distal nail. In general, two culprits are typically to blame if you’re losing toenails. One is a fungal nail infection, while the other is some sort of direct trauma to the nails. A fungus just might be the reason why nails can separate from the nail plate or nail bed. 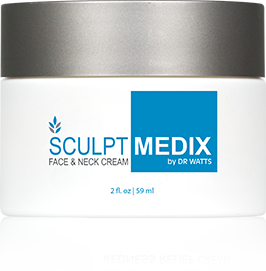 The most common reason these problems occur is a type of fungus known as a dermatophyte. This fungus feeds on keratin, a substance that is found in human skin and nails. But dermatophytes can do much more than cause the loss of toenails. They can also cause other foot problems, like athlete’s foot. When this type of fungus infects the feet, it can quickly spread to the toenails, causing them to loosen and possibly fall off. Can Bacteria Cause Nail Loss? A type of bacteria known as staphylococcus aureus can lead to not only nail loss, but also potentially dangerous staph infections. If these bacteria get into the blood vessels, they can, in some instances, lead to major illnesses affecting the lungs or heart. One of the ways staphylococcus aureus and other harmful bacteria get on the feet is through showering in public places, such as a gym locker room. 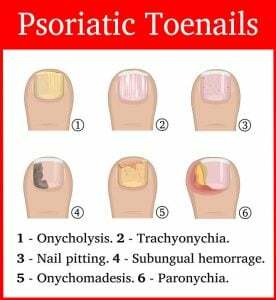 Psoriasis is typically thought of as a skin condition, leading to scaly patches as well as pain, itchiness, and burning.8But this condition can also result in loose nails. What are Some Common Injuries to Nail Bed and Nail Plate? Now, there are many potential causes of direct nail trauma, an injury to the nail. 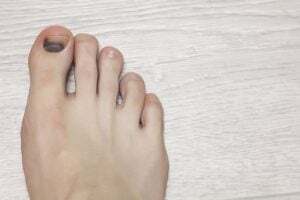 Accidentally closing a door on your toe, for example, can lead to bleeding under your nail – known as a subungual hematoma. Pressure from this kind of hematoma can be quite painful. There are several types of direct trauma that can lead to a subungual hematoma. These are just a few examples. In addition, wearing shoes that don’t fit correctly, over time, can cause nail deformities that look somewhat like a fungal infection. Thickening of the nails can occur, which can eventually lead to separation from the nail bed or nail plate. People can suffer toenail loss in some strange ways. One young woman lost toenails after getting what’s known as a “fish pedicure.” Yes, some people dip their feet in water-filled tubs and let tiny fish nibble away at skin calluses. If you’re a woman looking for ways to keep your feet looking beautiful, you might want to just stick to regular pedicures, with a nice nail polish for some flair. Just make sure the pedicurist is licensed and uses clean, sterile tools. How Can You Prevent Loss of Toenails? Now, there are a few things you can do to help keep from losing toenails. To help reduce the chances of a fungal infection, for example, always dry your feet thoroughly after they get wet. Also, make sure you wear clean socks every day, and rotate your shoes every day if possible. If you work at a job where you are at a risk of dropping objects on your feet, wear shoes with steel reinforcement in the toe. Keep your toenails trimmed as well. In the vast majority of instances, a loose toenail doesn’t mean you have any sort of major problem. Nail disorders, even ones that cause bleeding, may be alarming, but they’re usually not serious. That doesn’t mean these kinds of problems should be ignored. Talk to your doctor if you notice bleeding in your toenails, or if you experience unexpected nail shedding. Your doctor will be able to suggest the best treatment, so you can keep any potential health risks to a minimum.